To set up your sidebar, go to Appearance > Widgets and add any widget of your choice to the sidebar widget area. Customize as your please. Below are the settings we used for Rustic. 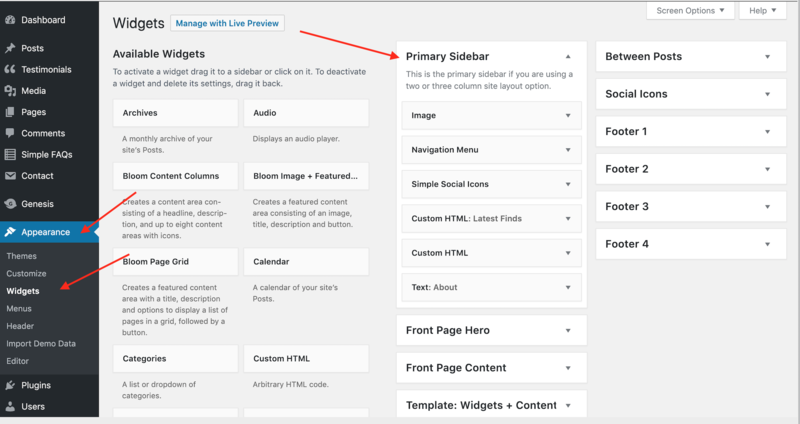 Drag and drop any widget to the primary sidebar widget area. Tip: To find a new widget, go to Plugins > Add New. Search for a widget then install and activate it. It will then show up in the below available widgets that you can then drag and drop to the primary sidebar widget area. The settings for each of the widgets are shown below. Tip: To display the first image, navigation menu, and simple social icons on a pink background, add the CSS class of "highlight" to each of these widgets, as seen below. To display the image without a border, add the CSS class of "image " to that widget, as seen below.